This workshop affords a unique opportunity to profile the role that surgical care plays in health care and development globally. Topics to be discussed include: the current status of surgical care needs globally, the principles of international surgical-care development, and opportunities for involvement. Although the concepts discussed will apply globally, the primary mandate of the CNIS is Africa, and it will be from this continent that illustrations will be drawn. The workshop is free of charge and refreshments will be served. Please register your seats. $30 Supplies goat-feet from the local market: This allows students to practice their skills. $50 Support a local course instructor to teach for the day: The key to our teaching model is training local medical professionals. We pay them a fee to assist in teaching the courses in partnership with our Canadian volunteers. $75 Knot Tying Board: Medical students learn how to tie sutures –otherwise known as medical stitching. The knot tying boards with needle holders and a supple of sutures enables students to hone their skills in surgical procedures. $100 Laceration repairs: Medical students need scalpels, needle holders, forceps and sutures to tend to a variety of serious wounds. $120 Support a local instructor to supervise students performing 6 C-Sections as part of their training. This training enables students to practice the procedure with supervision and guidance. $200 Provides instruments for C-Sections: C-Sections are necessary for maternal health complications in rural communities. The lack of instruments and skilled practice results in the death of countless women and their expecting babies. $250 Enables a student at a Clinical Officers Training School to become trained in 2-year program) and become trained in the Fundamental Interventions, Referral and Safe Transfer (FIRST) course. The students have the opportunity to further develop their skills in determining the severity of health issues, how to assess and stabilize a patient’s condition, and the means by which to safely transfer the patient. $500 Enables a student at an Assistant Medical Officers Training School to become trained in 3-year program in the Essential Surgical Skills (ESS) course to gain extensive training in obstetrical skills, including the ability to perform a C-Section, which are critically important for improving maternal health. 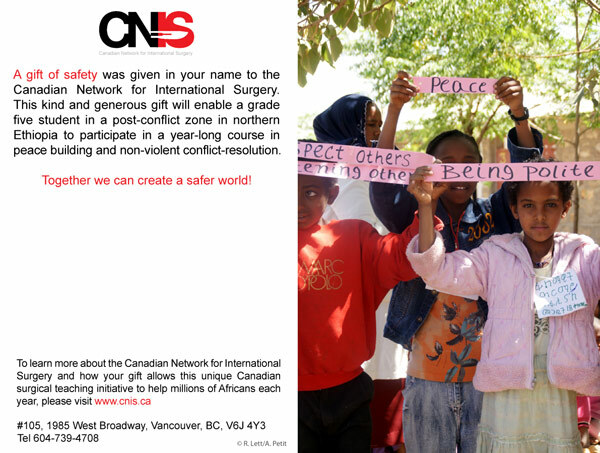 The Canadian Network for International Surgery (CNIS) has been teaching lifesaving surgical, obstetrical and nursing skills in sub-Saharan Africa for the past 19 years. Rather than performing operations, our Canadian professional volunteers share surgical skills with African healthcare students, providing them with practical skills that will save lives in their communities. The magic happens at the surgical skill labs established at the training institutions which CNIS partners with across sub-Saharan Africa. The skills labs are essential for students to receive adequate supervision and mentorship in a stress-free environment to learn and practice their skills. The skills labs provide a highly adaptable workspace for the diverse array of courses taught by CNIS. The students have the opportunity to hone their skills in a number of practices such as laceration repairs, and gain extensive training in obstetrical skills, including the ability to perform a C-Section, which are critically important for improving maternal health. In 2005, CNIS opened the first surgical skills lab in Addis Ababa, Ethiopia. The centre increased Ethiopia’s capacity to train and certify physicians, surgeons and other medical health professionals in obstetrics and surgical procedures. The inauguration of the Addis Ababa skills lab was the first of its kind in Africa. Since then, CNIS has completed skills labs in Gondar and Jimma, Ethiopia, Mbarara, Uganda, Malawi and Moshi, Tanzania. These centres run continuous courses throughout the year to further strengthen the capacity to teach safer surgery and obstetrics in sub-Saharan Africa. For $15,000 you can establish a skills lab that will provide student trainees with a myriad of learning opportunities that have significant value for their future as healthcare providers in their communities. We need your help in building these fundamental learning environments to continue the success of CNIS in sharing skills and saving lives. This generous gift will ship a box of new surgical and medical books, to help Africa’s future healthcare providers. Black background with a map of Africa made up of surgical instruments. CNIS logo on front and back. Sharing Skills Saving Lives. The price is $30 which includes the taxes and shipping. This generous gift will offer a Trauma Team Training course to an African police officer.